Another Obscure Classic Rock post and another underappreciated band. 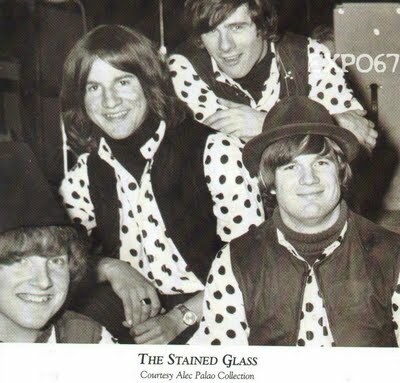 Stained Glass was a pop band from San Jose, California, that was formed in 1964 by Jim McPherson, bass, Roger Hedge, guitar, Bob Rominger, guitar, and Dennis Carrasco, drums. They all provided vocals. “My Buddy Sin” moves like a merseybeat tune (and this is understandable because their last recording was just that, a Beatles’ merseybeat song), but the band adds in some other elements that makes this song stand out. First off, the vocal harmony is unorthodox. It is not your typical light-hearted, fast-paced, early Beau Brummels’ like American merseybeat harmony. No, instead, it almost takes a page out of the Association’s handbook. The harmony is rich and delicate. It is fresh and entrapping, more like a choir than a pop group. The song also features a bluesy harmonica and a fast-paced blues guitar solo over an angelic vocal background. It is an odd mixture of genres, some popular at the time, and some prescient (British folk, for example). It, to me at least, seems like a strong second release. A great song. It is overlooked though, in favor of the band’s 1967 version (and following single) of “We Got a Long Way To Go,” which is, despite its popularity, a little trite and uninspiring. 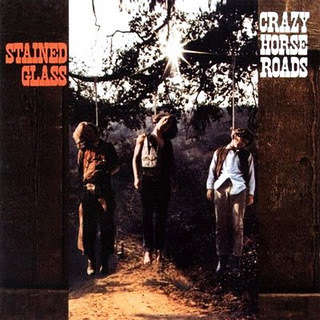 After another follow-up single and the departure of Hedge, Stained Glass released their first album Crazy Horse Roads, which is perhaps best known for its controversial cover (see picture below), but should actually be known as a strong release from a budding psychedelic band that sampled strong vocal harmony and garge rock flavor. The needle touches down on typical fuzzy garage-rock guitar, Stained Glass harmony, psychedelic sampling, and hints of folk. It is wholly diverse and filling. Yet it did not, and still has not, gained the recognition it deserves. This case kind of surprises me. Stained Glass was too good of a band to just fall into obscurity. They were able to fuse genres and that generally leads to success. Perhaps it also sometimes distracts listeners. I am including the most accessible song from the album and one of my favorites. Listen to McPherson’s driving, funky bass and Rominger’s loud hollow-bodied electric with fuzz. Catch the vibes. The psychedelic flavoring can be heard in the riff and solo, as well as the echoed choral endings. I hear Blues Magoos and a little Count Five. Pretty much, Stained Glass should have gained more success than they did and that is unfortunate. In 1969 Rominger was replaced by Tom Bryant and a second album, “Aurora” was released which didn’t sell well either. The group disbanded in 1970. According to the wikipedia page for the band, the very talented Jim McPherson died in 1985. Dennis Carrasco lives in the San Jose area. Tom Bryant lives on the east coast. Bob Rominger lives in Newnan, Georgia.